The 1970 World Cup was the first in which substitutes could be used and the intense heat in Mexico meant Sir Alf Ramsey made the maximum two changes in each of England’s four games. Shortly after falling behind in the iconic group stage match against Brazil, Ramsey made a double change on 63 minutes as Franny Lee and Bobby Charlton made way for Jeff Astle and Colin Bell. In a match remembered for the wonderful save by Gordon Banks, magnificent tackle by Bobby Moore and Brazilian majesty, Astle would be forever associated with the game’s less glorious moment as he squandered a golden chance to equalise after some dreadful Brazilian defending led to the ball falling to his feet. “You can’t win matches if you miss open goals,” declared BBC commentator David Coleman, a statement that overlooked the fact Astle was not actually in front of an “open goal” when he took aim. But for poor old Astle the miss would often crop up, with the ease of the chance growing with each telling. He rightly remains revered for his goalscoring exploits for West Bromwich Albion, but sadly he never found the net for his country. Probably the most widely discussed substitutions in England’s history, with only Graham Taylor’s decision to take off Gary Lineker against Sweden during Euro ’92 being obviously comparable. A week on from the Brazil game, Ramsey would withdraw Bobby Charlton and Martin Peters and bring on Colin Bell and Norman Hunter respectively and then see the dream of retaining the crown fade away against West Germany in the quarter-finals. A myth has grown that England were 2-0 up and looking home and dry when the changes were made so players could be rested for the next round, as well as it being inconceivable that the legendary Charlton could be withdrawn. In reality England had just conceded their first goal when Charlton went off (although they started to prepare to make the change before the goal went in) and it was at a similar stage to when the Manchester United veteran had left the field in the previous two games. And Hunter was then brought on to tighten things up defensively with them still leading 2-1 but having to withstand increased West German pressure. But the equaliser followed moments later and England lost 3-2 after extra-time, with the belief never going away that the changes had cost England as Franz Beckenbauer exerted increased influence following Charlton’s withdrawal. But arguably the real turning point had been a change made by the West Germans, Jurgen Grabowski coming on after 57 minutes and giving England full-back Terry Cooped a torrid time. For Charlton the experience would be particularly painful as he never played for England again after 106 caps, seeing his international career end on a bench in Leon. It also was the only time Hunter ever played in a World Cup finals match. The 1982 World Cup would be one of great frustration for Trevor Brooking and Kevin Keegan, two stars of their era who knew they would never realistically have a chance to play at another World Cup finals if they failed to overcome their injuries in time to feature in Spain. 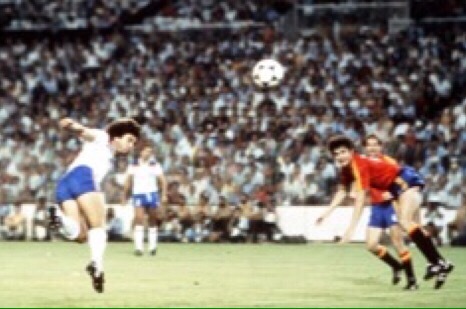 Keegan would end up driving through the night to catch a flight to see a specialist in West Germany to finally get back in contention and both men at last made the bench for the game against Spain in the decisive second round group phase match. They would enter the action with 26 minutes left, with the game goalless and England needing to win and score at least twice. “In his hour of need Ron Greenwood has turned to two men who have served him well in the past,” said BBC commentator Barry Davies. They would quickly find themselves in the heat of the action. Brooking had an effort saved, but far more infamous would be the opportunity Keegan squandered as he headed wide with the goal at his mercy. “It was a howler of a miss,” Keegan admitted in the BBC documentary Three Lions in 2000. Had he scored, it might have changed the tone of the night and set England up to get the second they needed. But the game faded out to a 0-0 draw and it would be the last time Brooking and Keegan ever played for England. 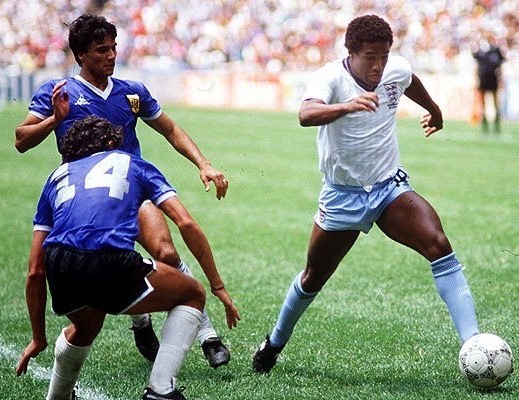 Two years after his great solo goal against Brazil, John Barnes was finding life with England less satisfying by the time of the 1986 World Cup as he was continually watching on from the sidelines. Chris Waddle was being preferred to him as a natural winger and Barnes played no part in England’s first four matches out in Mexico. It didn’t look like he would get on against Argentina either, until with 16 minutes left he replaced Trevor Steven with England trailing 2-0. Bobby Robson also brought Waddle on for Peter Reid, as the side went for width in a desperate bid to change the game. All seemed lost but Barnes would revitalise England during his cameo appearance on the left flank, whipping over a superb cross for Gary Lineker to pull a goal back and then producing a near carbon copy only for the ball somehow not to end up in the net. England were out but the Watford winger had shown the global audience what he was capable of and demonstrated to Robson that he could shine on the big stage. “I knew it was successful because those who had previously scoffed at wingers then said I should have brought Barnes on sooner,” wrote Robson about the substitution in his World Cup Diary. The next game against Sweden in September saw Barnes start an international for the first time in more than a year. For the second successive World Cup Bryan Robson’s involvement ended in the second game, leading to Steve McMahon. slotting into midfield for the matches against Egypt and Belgium. In the latter he made way after 71 minutes for David Platt, the Aston Villa midfielder offering a fresh pair of legs in a tight struggle. Platt, who had been playing in the Fourth Division with Crewe Alexandra little more than two years earlier, had shown his worth as an attacking midfielder with Villa during the 1989-90 season and would now make an impact with the world watching. With the game goalless in the dying seconds of extra-time, Platt would superbly hook home Paul Gascoigne’s free-kick to send England through. It sparked joyous scenes both in the stadium and back home and ignited England’s Italia ’90 campaign. It also marked a breakthrough for Platt, who had netted his first England goal. He came into the starting line-up and scored again against Cameroon and Italy and also in the penalty-shoot-out against West Germany. The ensuing years saw him become a key member of the side and a regular goalscorer. His best-remembered impact during the 1998 World Cup was his wondergoal against Argentina, but another joyful moment for 18-year-old Michael Owen in that tournament came in the second match against Romania. Glenn Hoddle started the tournament with the familiar forward line of Alan Shearer and Teddy Sheringham, but the game against Romania would mark a turning point. With 17 minutes left Owen replaced Sheringham and just six minutes later he was on hand to equalise. Although England would end up losing 2-1 in the closing stages, Owen had made a significant contribution including hitting the post late on. The Liverpool forward would be selected in preference to Sheringham against both Colombia and Argentina and go on to be voted BBC Sports Personality of the Year.